Her story starts in 2015. Katie and her husband Mike (also her running partner) were excitedly expecting their second child. Their daughter, Elizabeth, was just 3, and Katie had decided to leave her part-time job to focus on the family. Their life was work, family, running and planning for the next member of their family to arrive. And life was good. But in the early part of her pregnancy, Katie started getting extremely tired. At her annual physical, she mentioned this to her doctor, who chalked it up to being pregnant, running too much, and being on the go from the daily life of being a busy mom. She was overdoing it and needed to slow it down and get some rest. 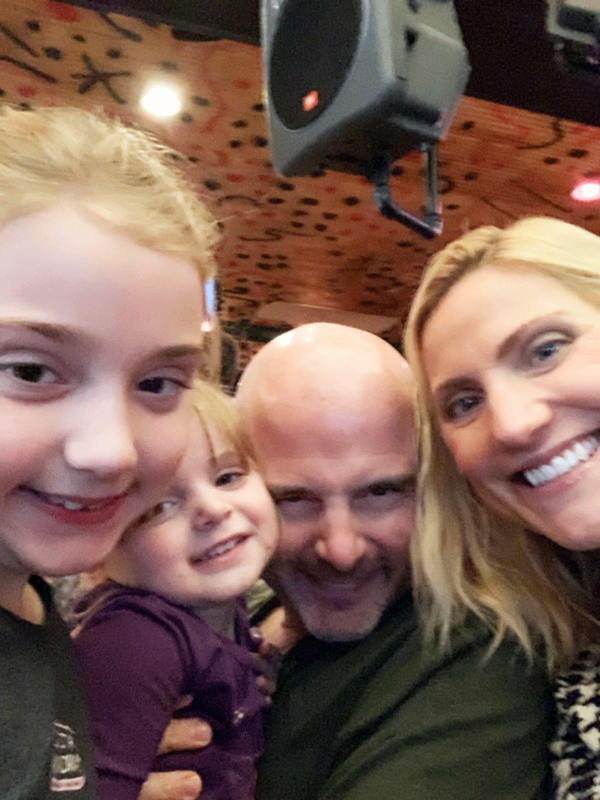 As time went by and the fatigue didn’t subside, Katie started to think this was more than just being tired from being a pregnant and active mom. Then she started getting some chest pains. Nothing serious, but they were bothersome. Since they would come and go, Katie guessed she tweaked something and that it would subside with a little time. But a few weeks went by and the fatigue and chest pains continued. Then one day she was reaching into the car to get her 3-year-old out of the car seat and felt a sudden and deep chest pain. It rocked her. It was a deep enough pain that she couldn’t lift her daughter and asked her husband to take over the car seat duties. The moment was a scary enough that it sent them straight to the ER to make sure everything was fine and the baby was okay. Heart tests were run and came back normal, blood work was good, and doctors suggested she was dealing with inflamed cartilage in her sternum. Their recommendation was once again to get some rest. Pain medication wasn’t an option because she was pregnant. Katie would just have to deal with it as it healed, and she went back to her day-to-day life. A few months went by. She was still tired and the chest pains still came and went. By now Katie was deep into her pregnancy and routinely visiting her OB in preparation for childbirth. During one visit, somewhere in her seventh month, Katie’s doctor told her it appeared there was a clogged milk duct in her breast and that they should keep an eye on it. If it wasn’t gone in a month, they’d do an ultrasound. It didn’t, and they did. During the ultrasound, Katie noticed the radiologists face as she read through the result – something was wrong. A biopsy was ordered. Katie was told it would be a week or two to get her results, which she knew would be a very stressful two weeks. The day after her biopsy was her next monthly OB visit. Still stressed about waiting for the biopsy results from what she hoped was only a clogged milk duct, Katie was shocked when her OB came in and uttered the words, “You have breast cancer”. Katie would need a new OB who handled high-risk pregnancies. Stunned, Katie left the office feeling completely isolated, with no plan and no one advocating for her. But being the person she is, Katie quickly took matters into her own hands. She called Dana Farber and said, “I’m 32 weeks pregnant and I was just told I have breast cancer. What do I do?” That moment was the beginning of her cancer journey; a battle she is fighting well into 2019. At the start, Katie had to wait a week for her first appointment. It was one of the longest weeks of her life. After what felt like endless testing, she ultimately met with a bevy of doctors. One of which was her new OB, who she adored. The first order of business was making sure the baby was okay, and the good news was that the daughter Katie was carrying was just fine. Then she met with oncologists, then surgeons to talk about options. Would she have a lumpectomy? A full mastectomy? Something else? Then things took a turn. A CAT scan showed a lesion on Katie’s sternum, the very spot where she was having chest pain months ago. Then the bomb dropped. She was told she had stage 4 metastatic breast cancer. Surgery for a lumpectomy or mastectomy was off the table because the cancer had already spread. Now a new plan was needed. Fortunately, certain chemotherapy drugs can be used with pregnant women, and Katie was just five weeks from carrying her baby to full term. She went for it and started chemotherapy. And then in the middle of this storm of bad news, the miracle of birth happened. After an easy delivery, little Grace was born. It was a calm and joyful time. Katie took about two weeks to recover, enjoying time with her husband, daughter and new member of the family. Then, it was back to treatment – which Katie was pressing to re-start. 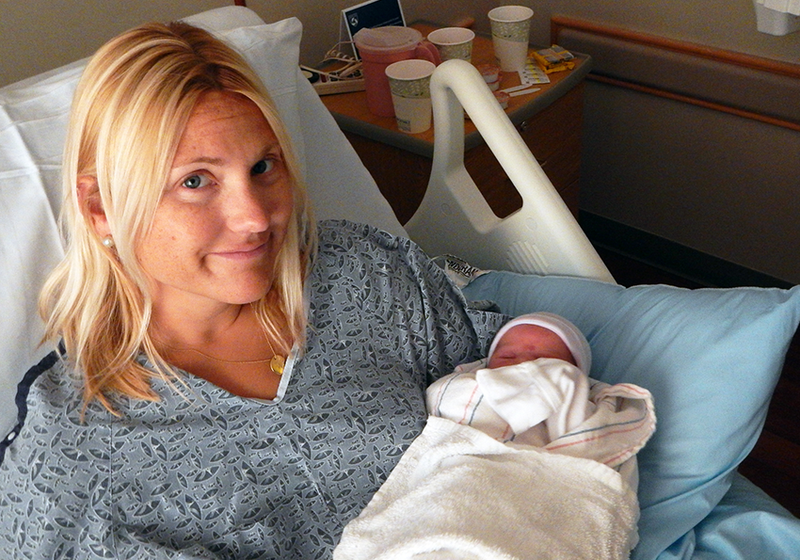 And now that she was no longer pregnant, doctors could add immuno- and targeted therapies. Katie then spent seven months on chemotherapy. In February of 2016, she moved to maintenance medications. Treatment was working, Katie was doing well, and for the next two years, life returned to as close to normal as possible. But then things changed. Again. In January of 2018, doctors noticed a small lesion on Katie’s liver. She was put on a new medication, but after three months it was clear that medication wasn’t working. They would need yet another plan. 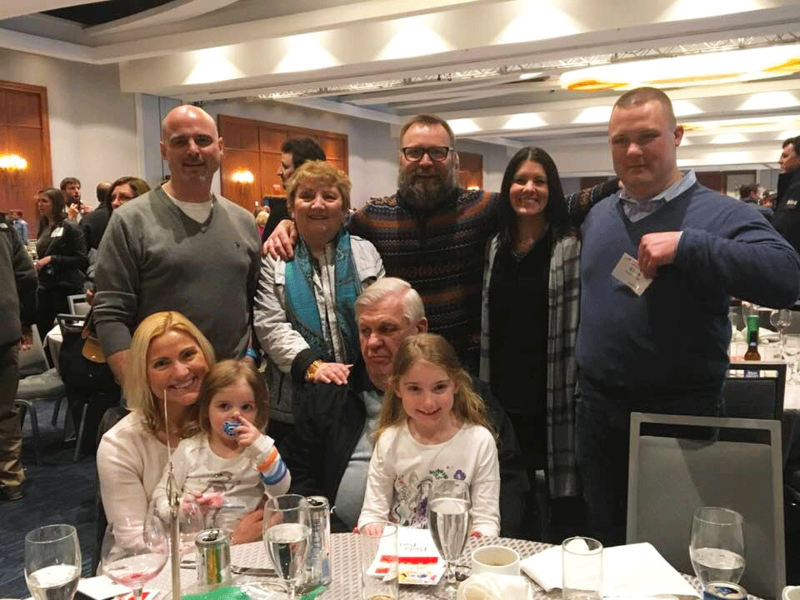 So, in May of 2018, Katie started on a clinical trial exclusively offered at Dana Farber and MGH. 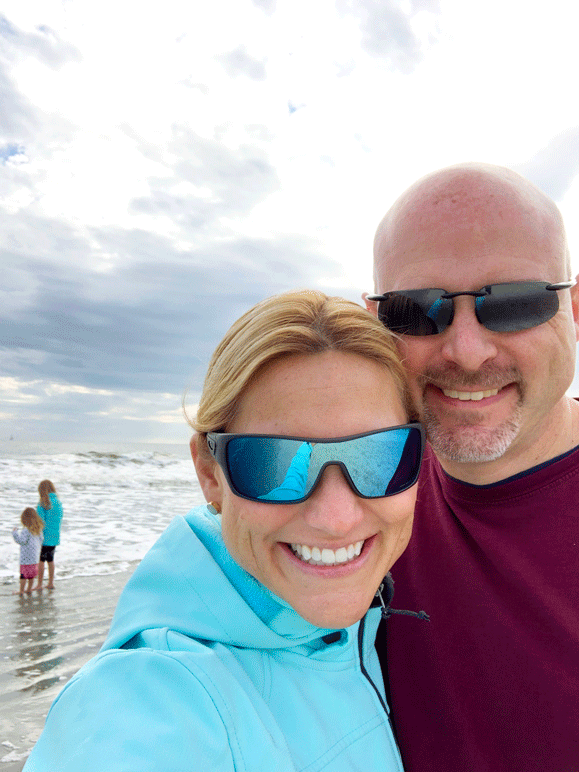 In January of 2019, Katie’s husband Mike was laid off from his job. At first, they made things work with savings they had put away. But as any cancer patient will tell you, the world doesn’t stop when your world goes sideways with this disease. Bills kept coming and the mortgage still needed to be paid. With no income, savings were being routinely tapped. And there was still preschool, student loans, utilities and health insurance to pay for. The added stress of making ends meet was difficult. As of this writing, Katie is still on her clinical trial and remains one strong and determined individual. 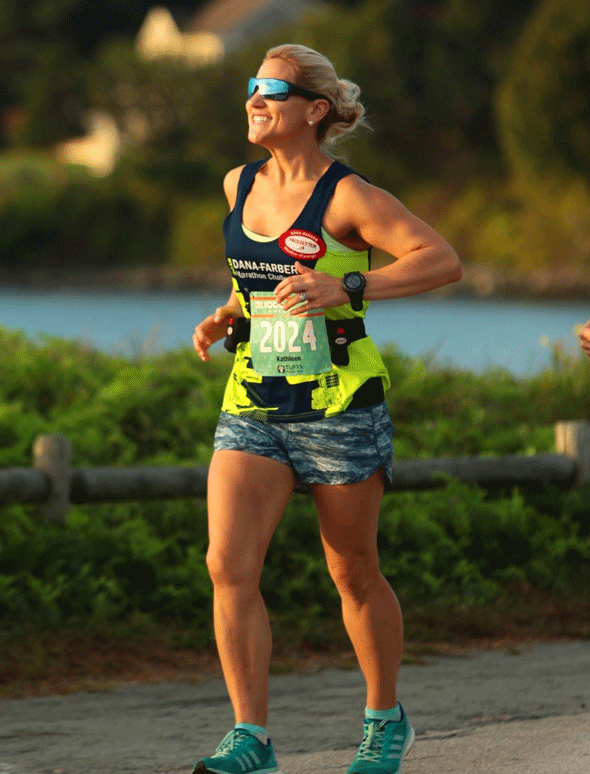 Despite the side effects that include achiness and fatigue from her new medication, she is still training for this year’s Boston Marathon – a race she is determined to finish. Then, she’ll continue putting everything she has into fighting this disease and being a wife, mother, and of course, an inspiration to everyone she meets.